What does that mean and what does it have to do with our seniors? Welcome to the world of the fast talker and the frustrated listener. As hard as I try and I have to be honest and tell you right off the bat that while I give it my best shot to not only open my mouth, speak distinctly and slowly, I too have been found to speak faster than the speed of light at times. This is a fast paced world and sometimes we are so on the clock to get the word out but to those who may have difficulty hearing, to those who need the more distinct way of speaking, this can be a real concern. 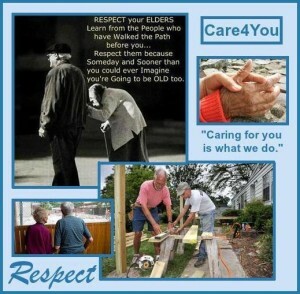 I’m not 20 anymore and by government standards I am elderly, (by the way, I consider that an honor!) and I too have spent many an hour speaking on the phone, at the drive thru for one of my favorite salads or in person somewhere and I find myself saying, “Huh” way too often. Like me, do you find yourself saying one of these other common phrases used when we don’t understand what is being said? And the respectful among us will add a ‘please’ to those phrases which is always nice to give and hear and I do try to be kind but I am getting to the point where I am just saying, “No thank you” to whatever they are selling or asking me to try. The seniors I have spoken to about this all seem to say the same thing. They don’t like hearing aids because with most of them there is too much noise surrounding the hearing device and that makes it frustrating to understand what is being said. Now that takes me back to my Mom who one day while sitting in her chair with all of us around her, she was listening to the conversation going on in the living room. Only one person was talking at a time and while I was observing Mom, I could see that she seemed to be following what was being said. She would smile and nod her head and even laugh at the appropriate times to the context of the conversation. That was great to see. Then two people starting conversing about something and then two other family members were talking about something else…all going on at the same time. I looked over at Mom and her facial expression had changed. She appeared to move her head into a position that looked like she was trying to understand. And then it happened. She started to cry. Not just whimper but actually full blown tears. Everyone stopped talking and I felt several ‘eyes’ on me. I looked at them and after a quick discernment, I suggested that maybe it was because she couldn’t understand what everyone was saying as too many people were talking at once and at speeds that were not only confusing to Mom but just a whole lot of noise being heard in the room. So what does someone with Dementia hear? Is it sometimes like the ‘noises’ of the hearing aid and then when there are people talking along with the noises in a manner that is difficult to understand, there can be a reaction. A reaction of tears or anger or withdrawal? Consider this video which seems to show what it’s like to spend 12 minutes walking in the shoes of a person with dementia….in this case, Alzheimer’s Disease. Wow…what an eye opener for me. and this makes me want to really try to understand what it is like for them in their world and when speaking with our seniors, whether they have dementia or not, to try and speak more clearly and more distinctly and yes…more slowly, with kindness and respect. November is a time to express thanksgiving. 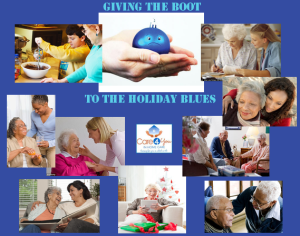 Care4You is so thankful for all of our clients and we are also so very grateful to those of you who support us in our dedication to our clients. 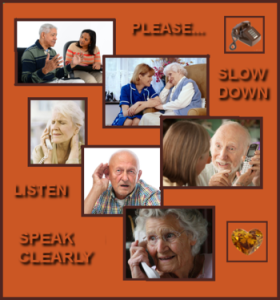 Our desire is to listen to the concerns of our seniors, their families and their friends in an effort to bring understanding to everyone who has an ear to hear.